New York and California vie for No1 spot amongst top 10 states. NY wins! Annual US green municipal bond issuance reached a new record in 2017, passing the symbolic USD10bn mark. New York retook the lead from California and ended the year with bragging rights as the US state with the highest issuance of municipal green bonds during the year, and the highest cumulative issuance to date. Our latest analysis of US muni issuance finds the total on December 31st stood at an annual record of USD11.05bn, up from USD7.11bn in 2016. New York has the highest 2017 total at USD4.49bn, and California followed with USD4.32bn for the year. Internationally, our Climate Bonds 2017 Highlights report shows a whopping USD155.5bn in green bonds were issued in 2017 with the US leading the global Top 10 at USD42.4bn, almost double that of China (USD22.5bn) and France (USD22.1bn), in second and third place respectively. At USD11.05bn green municipal bonds comprise 26% of the 2017 US total muni issuance. A December, a USD2.17bn issuance confirmed the NY Metropolitan Transportation Authority (MTA) as the leading municipal green issuer to date, and was the sixth largest green bond issued globally during 2017. 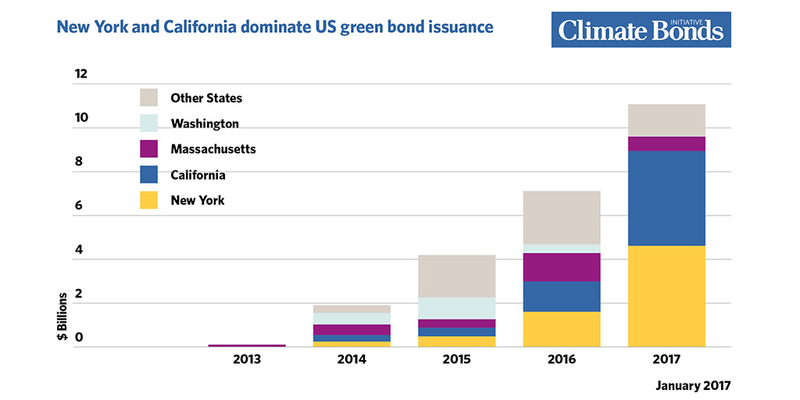 Repeat green issuance from MTA totalling USD5.52bn (Climate Bonds Certified via our streamlined Programmatic option for ongoing issuers) helped New York regain first place over California. Other notable issuance in 2017 included California Health Facilities Financing Authority, Massachusetts Water Resources Authority, State of Connecticut, Iowa Finance Authority, San Francisco BART, San Francisco PUC and New York State Finance Housing Authority. You can find the full table here. 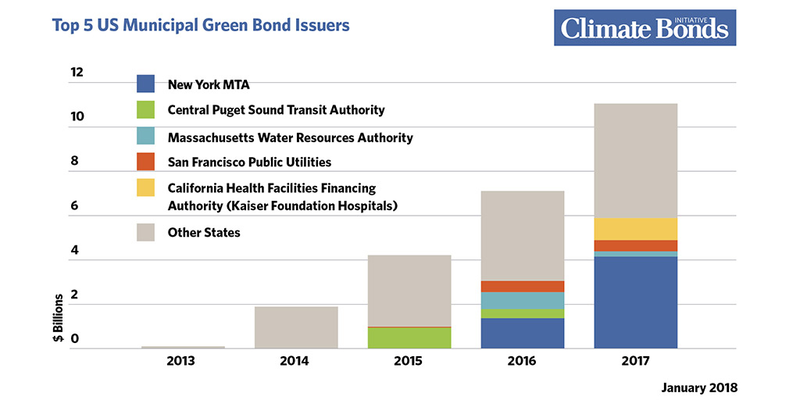 Helped by smaller bond issuances in California, the transport sector has come close to passing sustainable water as the largest overall segment of municipal green bonds with more than $8.54bn cumulative issuance into the market. $5.39bn of this was issued in 2017 alone, more than double the $2.08bn issuance of 2016. “More than 10 new US municipalities entered the green muni market in 2017. We expect this trend to sharpen as institutional investors increasingly seek green investment products for their portfolios." Massachusetts was the first state to enter the green muni market in 2013 with a USD100m green bond. Issuance in New York and California started in 2014, the first CA issuer being California State (USD300m) and the first NY issuer, New York State Environmental Facilities raising USD213.6m. Examples of significant US municipal issuers to date include the Central Puget Sound Transit Authority who have raised USD1.34bn, Massachusetts Water Resources Authority with USD1.04bn, San Francisco Public Utilities Commission USD1.04bn and California Health Facilities Financing Authority USD983.4m. After the big two, Massachusetts, Washington, Connecticut, Iowa, Indiana, Colorado, District of Columbia, and Illinois filled out the remaining Top Ten states for total cumulative issuance from 2013 to December 31st. Despite its smaller size, Massachusetts has maintained its position in the top three as the market has accelerated in the last two years. Top 10 US Municipal Green Bond Issuers cumulative total and rank table here. 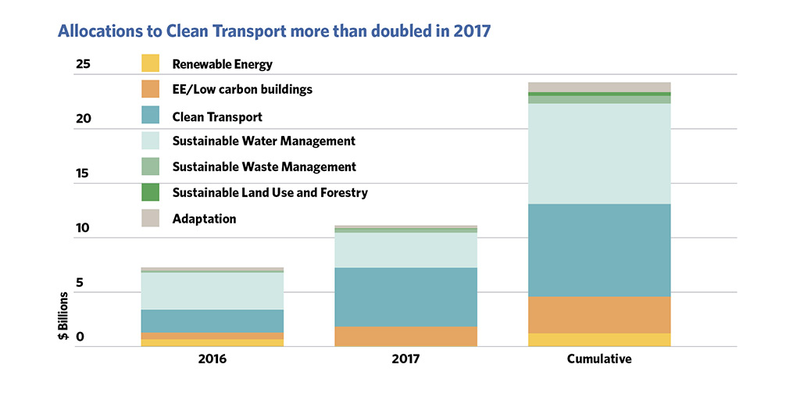 Climate Bonds is forecasting green municipal issuance to almost double in 2018 and reach USD20bn. Increasing emphasis on infrastructure spending and the need for need climate aligned infrastructure. Increasing institutional investor demand for green and ESG based investments. Other sub national based climate actions will also have an impact. The two-day California Green Bond Symposium on Feb 27-28 convened by State Treasurer John Chiang is sure to have a ripple effect. If you can make it to Santa Monica next month, don’t miss Our Director of Markets Justine Leigh-Bell on the agenda. Who will win in 2018? More green muni bonds are on the way, the race for 2018’s top spot is well and truly on!